Unless you have been living under a rock the last few days – Penn State upended Ohio State in Columbus (28-9). It was a match that saw the Nittany Lions prevail in nearly every big match including a fall for Bo Nickal at 197 pounds. The Pennsylvania natives who competed in the dual didn’t do as well with them going (2-5) as Jason Nolf and Vincenzo Joseph were both winners. Luke Pletcher (Latrobe, PA) was unable to get past Penn State’s Roman Bravo-Young at 133 pounds falling (2-1) in tiebreaker. Jarod Verkleeren (Greensburg, PA) was on the receiving end of a fleeing the mat call that was a head scratcher falling to Ohio State’s Micah Jordan (10-8). Vincenzo Joseph (Pittsburgh, PA) took out fellow Keystone State wrestler Te’Shan Campbell (Penn Hills, PA) at 165 pounds and Ethan Smith (Latrobe, PA) fell to Penn State’s #1 Mark Hall (12-4) at 174 pounds. The Pitt Panthers made headlines this weekend when they went on the road at defeated #8 N.C. State (18-16). The win was lead by a trio of Pennsylvania grapplers who picked up critical wins to claim the upset victory. 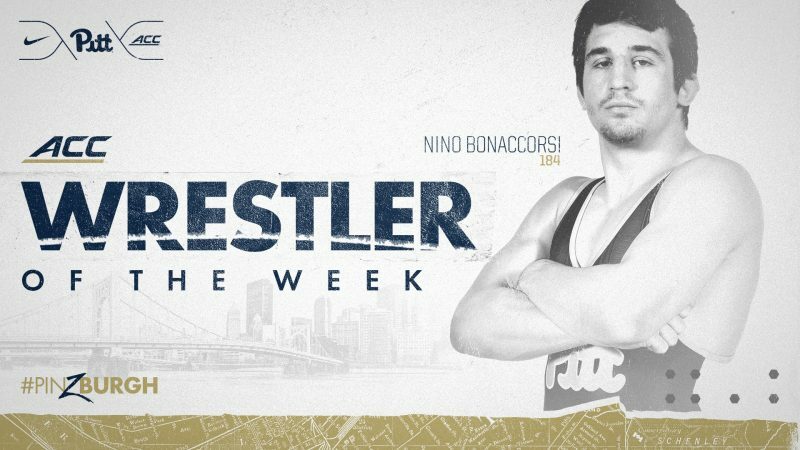 At 174 pounds unranked Gregg Harvey (Boyertown, PA) earned a (6-4) upset win over #20 Daniel Bullard (N.C. State) which was followed up by teammate #13 Nino Bonaccorsi (Bethel Park, PA) at 184 pounds who scored his biggest win of his career. The redshirt freshman knocked off #3 Nick Reenan (N.C. State) by major decision (8-0) to not only get a huge victory but also score four team points with the major. At 197 pounds Kellan Stout (Mt. Lebanon, PA), who entered unranked in the Nation, took out #20 Malik McDonald (N.C. State) by decision (5-4). That put Pitt behind (16-14) but #14 Demetrius Thomas (Pitt) scored a match clinching major decision at heavyweight (17-5) over Deonte Wilson (N.C. State) to seal it up (18-16) for the Panthers. Pennsylvania natives are listed in red!